Baker Mayfield in midst of throwing to a team member. Sunday, October 21st– the Browns had another game ahead of them. 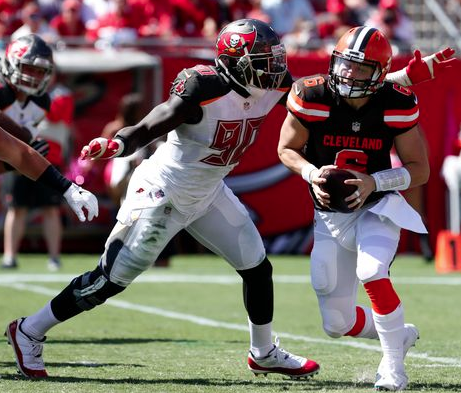 The Browns were set to play the Tampa Bay Buccaneers at the Raymond James Stadium at 1 p.m. At the start of the game, the Browns record was 2-3-1, while the Buccaneers were 2-3. The game started strong for the Browns with a quick 2 points coming from a safety. They didn’t lead for long, the Browns went into halftime losing 16-2 The offense seemed flat and the defense was doing the best they could against a high-powered offense. In the second half, Baker Mayfield rushed for 41 yards, with 35 coming on second-and-26 play in the fourth quarter. Another rush, on fourth-and-2 in the second quarter, ended with Mayfield fumbling the ball out-of-bounds short of the first down marker at the Buccaneers 10-yard line. The Browns would eventually go into their 4th overtime game this season which puts the Browns 1 game below the record for most overtime games in a season. The Browns still have 9 games to play, on pace to break the record. None the less its been an exiting season. The Browns would end up losing to the Buccaneers 26-23 Sunday with 1:50 left in OT. Chandler Catanzaro lead Tampa Bay to a victory by kicking a 59-yard field goal. The Buccaneers took advantage of a Jabrill Peppers’ fumble on a punt return that started the Buccaneers at the Browns’ 48 with 3:12 left in the 10-minute session. The Browns would put up a fight sacking Tampa Bay’s QB, Jameis Winston, for over 20 yards before the Bucks would reach the Field goal target line.